Sound designer Ken Travis teased the show’s sonic magic from a mammoth system comprised of 40 wireless mics and eight channels of QLab sound effects routed through a Studer Vista 5 console, then distributed via 192 TiMax matrixed output channels (three 64 x 64 TiMax SoundHubs) to more than 200 d&b audiotechnik loudspeakers arrayed throughout the theatre. 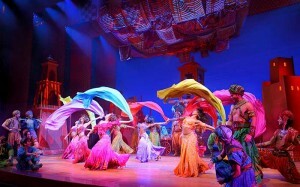 For vocal localisation, a TiMax Tracker system, with its unobtrusive radar tags cleverly concealed in headwear and costumes, enabled actors to move between 14 pre-defined stage zones — left-right, front-back, and up-down (the magic carpet...) — while their vocal amplification followed them automatically as SoundHub’s delay-matrixed Image Definitions morphed seamlessly in real time. Travis explains: "On this show I had more toys than usual. Disney really wanted a cinematic sound design, a big immersive experience like you’d get on a Disney ride, but they didn’t want it to be distracting," he said, "so they gave me everything I asked for in order to achieve that. 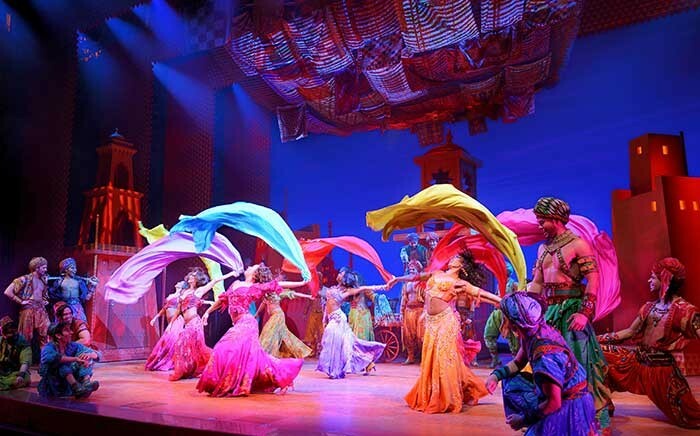 One of the sound mixers who worked on the animated film version of Aladdin sat with us one day and said, ‘I know how I would do this on a film, but how the heck are you doing it live?’ "
The transition from one theatre to another was simple even on this scale. Travis describes: "All the math changed with the dimensions of the theatre, but what we learned from on-stage was bang on." The localisation and spatialisation provided by TiMax enabled Travis to achieve effects that would previously have been virtually impossible. "A good example is the spooky voice in Jafar’s lair. We wanted the voice to be kind of creepy and to keep the voice moving and floating around your head. As he gets angry, it seems to come up from under your feet when the subwoofers start shaking the floor, and then the voice image shifts straight to the centre cluster," he said. 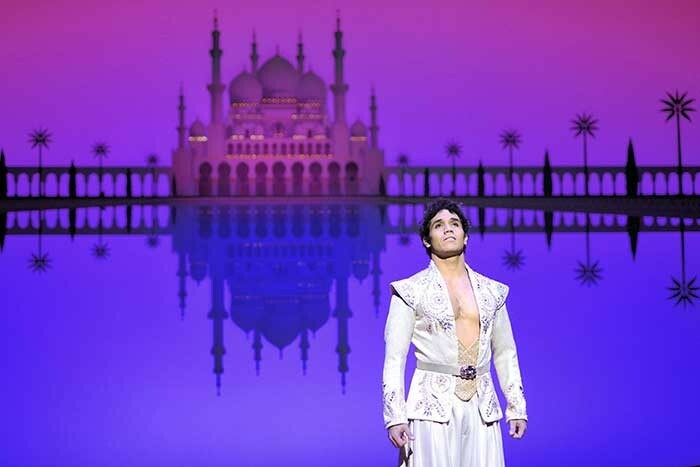 Similarly, the flying carpet was given incredible movement: "When Aladdin and Jasmine rise up in the air on the carpet, if you close your eyes you can hear the audio going right up with it. We’ve sat with the actors when they got to watch it, and even they were like, ‘Wow! The voices are coming right from the actors’ mouths!’ " Travis recalled. The TiMax technology received high praise from Travis: "What we like about the system is that it never calls attention to itself, but it adds a ton. And we’re delivering to all three levels—the orchestra, mezzanine, and balcony all have the same system, so everyone gets the same show." 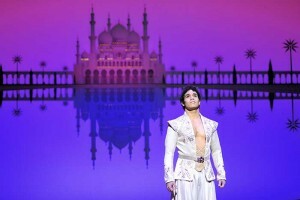 Travis concludes, "Aladdin is one of those shows where the director can play stump-the-sound-designer. Go ahead; ask for anything. This system is the Genie."